The current drought in California is the worst the state has seen in at least 1,200 years, according to a recent study published by the American Geophysical Union. Scientists at Woods Hole Oceanographic Institute and the University of Minnesota reconstructed California’s temperature and precipitation history back to 800 A.D. using tree ring data. Hidden in this millennium of data they found as many as 66 dry periods of at least three to nine years. In the entire 1,200 year period they studied, there were only three droughts that were similar in nature to the current drought. Though none have been as severe as what California has seen in the three years since 2012. Not even the historic droughts of the late 1970s, nor the late 1980s. The study also found that 2014 was the worst single drought year in the past 1,200 years, and that approximately 44 percent of California’s 3-year droughts have gone on to last another year, or longer. Interestingly, California’s current lack of rainfall is not unprecedented in the 1,200-year record. The study concludes that the current drought was a result of both below-average precipitation and record-breaking high temperatures, and that the latter could have intensified the drought by about 36 percent. This week has been particularly rainy one for California, which is being blasted by a series of storms that are channeling moisture into the state. San Francisco has seen over 3.5 inches of rain since Monday, compared to 2013, when they only received 0.35 inches in the whole month. They’re average rainfall for the entire month of December is 4.03, so the city is well on it’s way to at least making par. Los Angeles has racked up over 1.5 inches of rain so far this month, where the December average is 2.05. However, much, much more rainfall is needed to put a dent in the drought. 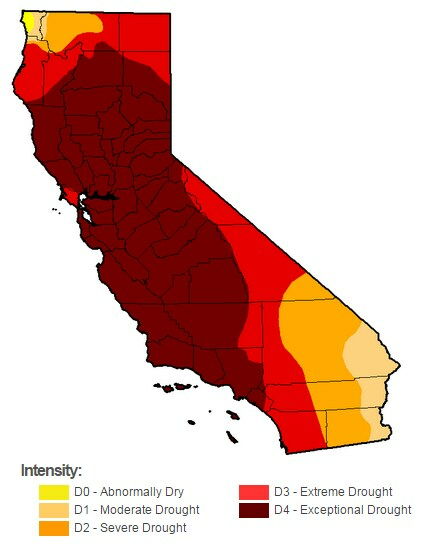 Fifty five percent of California remains in an “exceptional drought” as of Thursday — the most severe classification on the scale used by the U.S. Drought Monitor, and 100 percent of the state remains in at least a moderate drought. Many of the state’s critical reservoirs remain well below their historical average. While this week’s rain and snow will be a step in the right direction, California still has a long way to go to reach total drought abatement. As of October, the National Climatic Data Center was estimating that most of California’s central valley as well as Northern California would need anywhere from 18 to 21 inches of precipitation over the next six months to end the drought. This week’s rains will be beneficial, but they won’t be nearly enough.